It has 62 faces: 30 squares, 20 regular hexagons, and 12 regular decagons. It has more vertices (120) and edges (180) than any other convex nonprismatic uniform polyhedron. Since each of its faces has point symmetry (equivalently, 180° rotational symmetry), the truncated icosidodecahedron is a zonohedron. The name truncated icosidodecahedron, given originally by Johannes Kepler, is misleading. An actual truncation of a icosidodecahedron has rectangles instead of squares. This nonuniform polyhedron is topologically equivalent to the Archimedean solid. The name great rhombicosidodecahedron refers to the relationship with the (small) rhombicosidodecahedron (compare section Dissection). There is a nonconvex uniform polyhedron with a similar name, the nonconvex great rhombicosidodecahedron. If a set of all 13 Archimedean solids were constructed with all edge lengths equal, the truncated icosidodecahedron would be the largest. where φ = 1 + √5/2 is the golden ratio. A toroidal polyhedron can be formed from the truncated icosidodecahedron, with pentagonal faces excavated by pentagonal rotundae, and a final excavated central rhombicosidodecahedron. 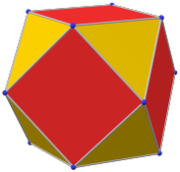 The truncated icosidodecahedron is the convex hull of a rhombicosidodecahedron with cuboids above its 30 squares whose height to base ratio is the golden ratio. The rest of its space can be dissected into 12 nonuniform pentagonal cupolas below the decagons and 20 nonuniform triangular cupolas below the hexagons. The truncated icosidodecahedron has seven special orthogonal projections, centered on a vertex, on three types of edges, and three types of faces: square, hexagonal and decagonal. The last two correspond to the A2 and H2 Coxeter planes. The truncated icosidodecahedron can also be represented as a spherical tiling, and projected onto the plane via a stereographic projection. This projection is conformal, preserving angles but not areas or lengths. Straight lines on the sphere are projected as circular arcs on the plane. Schlegel diagrams are similar, with a perspective projection and straight edges. Within Icosahedral symmetry there are unlimited geometric variations of the truncated icosidodecahedron with isogonal faces. The truncated dodecahedron, rhombicosidodecahedron, and truncated icosahedron as degenerate limiting cases. In the mathematical field of graph theory, a truncated icosidodecahedral graph (or great rhombicosidodecahedral graph) is the graph of vertices and edges of the truncated icosidodecahedron, one of the Archimedean solids. It has 120 vertices and 180 edges, and is a zero-symmetric and cubic Archimedean graph. Bowtie icosahedron and dodecahedron contain two trapezoidal faces in place of the square. This polyhedron can be considered a member of a sequence of uniform patterns with vertex figure (4.6.2p) and Coxeter-Dynkin diagram . For p < 6, the members of the sequence are omnitruncated polyhedra (zonohedrons), shown below as spherical tilings. For p > 6, they are tilings of the hyperbolic plane, starting with the truncated triheptagonal tiling. ^ Weisstein, Eric W. "Icosahedral group". MathWorld. Williams, Robert (1979). The Geometrical Foundation of Natural Structure: A Source Book of Design. Dover Publications, Inc. ISBN 0-486-23729-X. Cromwell, P.; Polyhedra, CUP hbk (1997), pbk. (1999). Eric W. Weisstein, GreatRhombicosidodecahedron (Archimedean solid) at MathWorld. Klitzing, Richard. "3D convex uniform polyhedra x3x5x - grid". 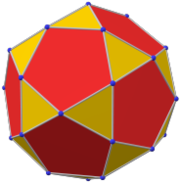 Weisstein, Eric W. "Great rhombicosidodecahedron". MathWorld. * Weisstein, Eric W. "Great rhombicosidodecahedral graph". MathWorld. This page was last edited on 9 February 2019, at 23:57 (UTC).